"Inspired by a popular idea in color theory (in which a drop of black paint has the capacity to "ruin" any shade, the queer individual parallels this profound ability to affect, further, enliven their surroundings, even reclaiming the once derogatory term as means of empowerment) photographer David-Simon Dayan set out to document LGBTQ nightlife--environments defined by inclusivity--in LA and NY through his photo series, Black Paint." Click title to be redirected. Prints acquired by the Museum of Fine Arts, Boston from the Alex Katz Foundation. Two Male Dancers, Lollipop, Corona, and Brad. Editorial and Interview with artist Mela Murder. We discuss her shifting through art forms, single motherhood, and the lessons we’ve learned through universal tests. Editorial with musician Antiboy for Sencillo Magazine. Editorial with musician Jesse Saint John. Interview and photo series with performance and film artist, Love Bailey. We slather up a chat about choosing a name, her electrifying short film, “Slather it Up,” quieting the mind so the magic of the universe can flow, and making sure that queer visibility doesn’t equal exploitation. Cover story, editorial for SHUBA MAGAZINE, December 2017. Photo story with actor Kai Caster for FGUK MAGAZINE. Series spotlight in DRØME Magazine Volume III. A self-portrait series connecting the artist to others who have preceded. by utilizing the unique process of acting as both photographer and subject, The artist explores the collaborative quality of creating imagery, not alone but in conversation with the artists referenced; those who have widely inspired, nudging the path of history forward. Series spotlight in C.A.P. 74024 “A Language of Body” Issue. A photographic series exploring the relationship between sexual consumption and violence. Time and time again, we’re reminded that the two are undeniably linked. In studying the gaze as it applies to the male form—in the vulnerable state of anonymity—often placed on the individual without consent, I’ve noticed the ease in which viewers comment on the subject’s placement on the sexual appeal totem pole; a dehumanized vessel, valued entirely by said physicality with no regard to the entirety of their being. In agreeing to be photographed in this manner, veiling themselves, a play on reclaiming consensual anonymity while teetering on the idea of consumption—an act culturally reserved for the femme form—is born. Photo story with actor and artist Juan Manuel Salcito. Interview and photo story with Madison Iseman. We discuss doing what feels right, DIY horror films, being a part of one of the most anticipated films this year; Jumanji: Welcome to the Jungle, and the importance of projects that encourage women and challenge people's opinions. Artist David-Simon Dayan continues his 35mm series ‘BLACK PAINT’ in capturing the costumed expression of those during Halloween. Interview and editorial with musician Brandon Skeie. Fashion editorial for LUCY'S MAGAZINE, October 2017. Interview and editorial with musician Chloe Chaidez from Kitten the band. We discuss her time living in a co-op, the gift of capturing seasons of life through craft, and the importance of having female role models. Interview and editorial with artist and blogger Charlie Barker. We discuss the positives and negatives of growing up in the digital age, the dichotomy of creating our paths by acting without pressure while simultaneously being on the pursuit of perfection, and finding inspiration in quotidien life. Interview and editorial with artist Mikel Lol. 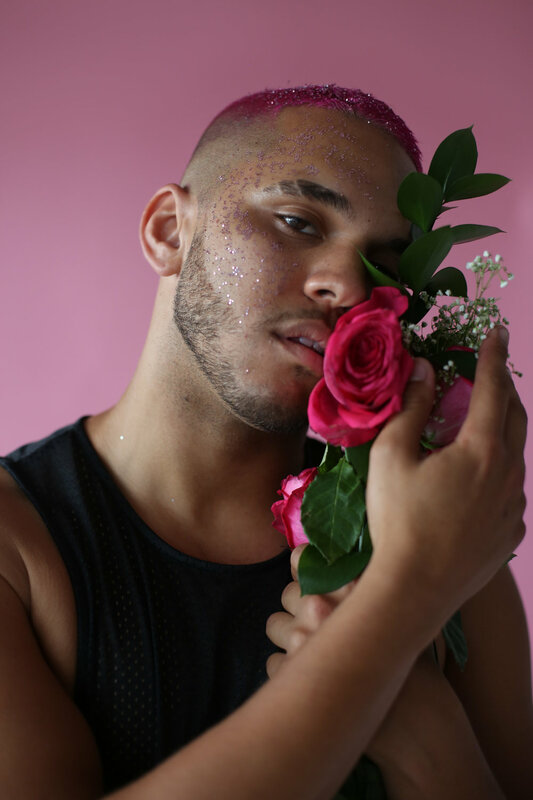 We discuss using the body as a canvas for self-expression, seeking escape from heartbreak and bullying through craft, balancing masculine and feminine energy, and affecting change in the LGBTQ+ community through artistry. Interview and film for "Sky Doesn't Blue" with musician SARO. We discuss his experience opening for Miguel, death, rebirth, and growing into a confident individual and artist by reclaiming "flaws." Photo series taken at New York City's Pride 2017. Interview and editorial with Samantha Robinson, lead actress in Anna Biller's "The Love Witch." We discuss coming to the states as an actor, being a part of feminist projects, and using nervousness as a tool for growth. Photo story of actor and dancer, Mela Murder, of Sean Baker's next film not yet released. From series "Letters to Your Younger Self." Letter written by Mela to her unborn daughter. Photo series "Two Male Dancers" paired with interview Out Magazine. Editorial "Tenderness" Jute Magazine, March 2017.